Harold Skaggs (at podium) recipient of the Jim and Eddie Kirk Fair Supporter Award. 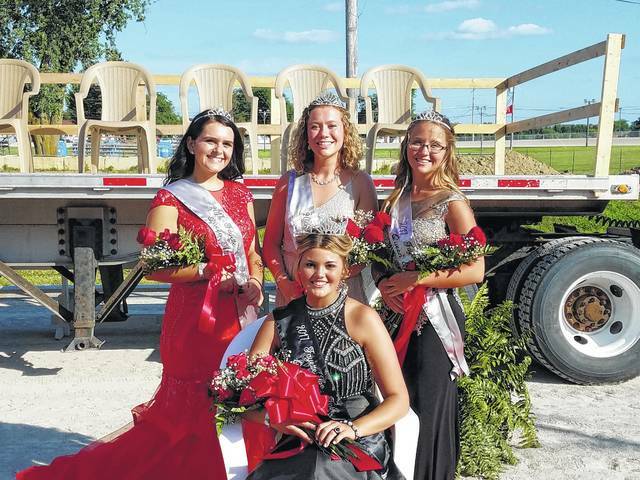 The 2017 Fayette County Fair Queen Marissa Sheets (seated) and the 2017 Fair Queen Attendants (L to R): Susanna Eckstein, Clare Sollars and Skylynn Barden. Marissa Sheets, the 2017 Fayette County Fair Queen. 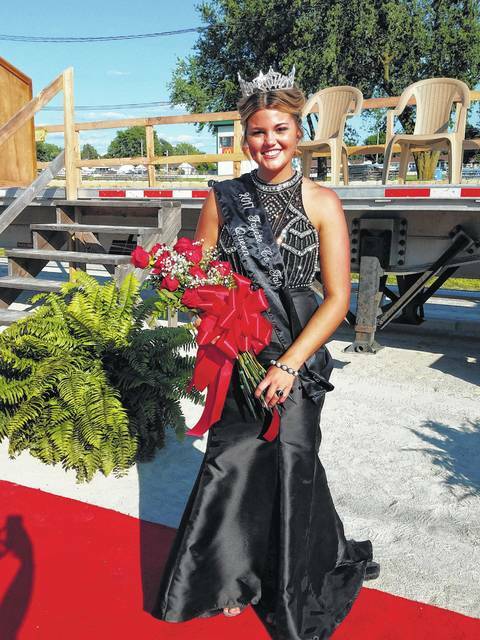 Marissa Sheets was named the 2017 Fayette County Fair Queen Sunday evening during the opening ceremony and will join the esteemed group of fair royalty. The opening ceremony began shortly after 5:30 p.m. at the McDonald’s Grandstand on the Fayette County Fairgrounds. The commodity queens, 2016 Fair Queen Bethany Reiterman, and the 2017 candidates arrived in limousines that drove around the length of the track and dropped them off on the “Red Carpet” in front of the grandstands. Various guests, sponsors for the fair, and senior and junior fair board members were introduced and thanked for their continued support of the fair. Senior fair board president Dr. Robert Schwartz took to the podium and awarded the Jim and Eddie Kirk Fair Supporter Award to Harold Skaggs. Skaggs has been a part of many efforts at the fairgrounds since the 1980s. While tending to the fairgrounds, Skaggs served on the fair board, helped to bring the harness racing track to its current condition and helped with updating facilities all over the grounds, among many other projects. Schwartz thanked Skaggs for his years of service and presented him with the award. Junior fair coordinator for the senior fair board, Amanda Ivey, presented an award to Clare Sollars. The award, the President’s Award, is given to a junior fair board leader who has worked hard throughout their 4-H career. Ivey said that Sollars has worked incredibly hard to ensure that her peers on the junior fair board received the help they needed. Also during the ceremony, Eddie Fisher, with the Fayette County Honor Guard, explained and demonstrated the significance of the 13 folds for the American flag. 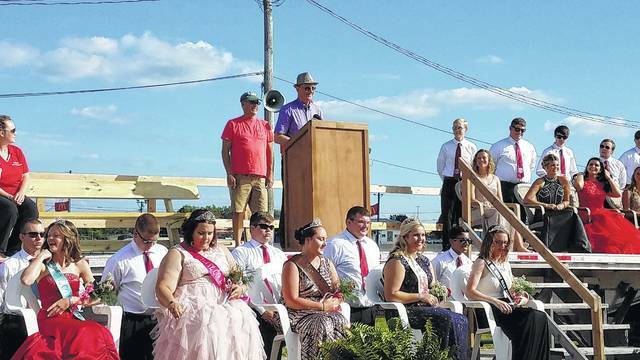 Shortly after naming the three other candidates (Skylynn Barden, Clare Sollars and Susanna Eckstein) as the 2017 Fayette County Fair Queen Attendants, Sheets was announced as this year’s queen. Following the ceremony, Sheets and the attendants cut a ribbon and declared the Fayette County Fair officially open. Additionally, Boy Scout Troop 67 and Cub Scout Pack 67 held a flag retirement ceremony following the opening ceremony. Local veterans, first responders and Fayette C0unty Sheriff Vernon Stanforth helped with the flag retiring. https://www.recordherald.com/wp-content/uploads/sites/27/2017/07/web1_20170716_175350.jpgHarold Skaggs (at podium) recipient of the Jim and Eddie Kirk Fair Supporter Award. https://www.recordherald.com/wp-content/uploads/sites/27/2017/07/web1_20170716_181716.jpgThe 2017 Fayette County Fair Queen Marissa Sheets (seated) and the 2017 Fair Queen Attendants (L to R): Susanna Eckstein, Clare Sollars and Skylynn Barden. https://www.recordherald.com/wp-content/uploads/sites/27/2017/07/web1_20170716_181846.jpgMarissa Sheets, the 2017 Fayette County Fair Queen.